Rocky IV has one of the best training sequences in movie history. The battle between Rocky Balboa, and Ivan Drago is Legendary. The stark contrasts of each of their training styles – and fighting styles – gives even more drama to the fight and to the storyline. Rocky is unpolished. He’s a brawler. He takes you to your depths, and then makes you quit. He breaks your will. His training style reflects this. It’s bear bones, no frills, no gimmicks. There are no machines, no fancy equipment or testing. It’s raw. Rough. Hard and gruelling. Drago is a machine. He’s been, and is being, created. His training is high-tech. It’s revolutionary. He has every piece of equipment need. But, the guy still works as hard as a human possibly can. He lifts heavy weights, and everything is measured. His power, speed, and endurance are all tested daily. His life revolves around training. He eats, sleeps, and trains. There isn’t a whole lot of anything else in his life. Over the next two articles I’ll give you two very contrasting workouts. The first one is Drago’s. You’re going to work your arse off in an effort to build speed, power, strength, and top all of that off with endurance. The result: Lean Muscle. The second workout will be Rocky’s. It’s bare bones. It’s raw. We’ll be using the basics: barbells, tires, chains, and whatever make-shift equipment we can concoct. Both workouts will focus on performance. We’re preparing for the fight of our lives here. We have one month to get ready and there’s no time to waste. This is a great way to achieve an awesome goal, fast. The results of focusing on performance, combined with the urgency of having to get in amazing shape in 4 weeks will be a ton of lost fat, and a crap load of lean muscle gained in a very short time. Drago is a product of the Soviet Union and their need for physical supremacy. This fight isn’t Tyson vs Holyfield. It’s not about a big payday. It’s Louis vs Schmelling 2, where two nations have so much riding on their fighter’s. It’s America vs the Soviet Union in the heart of the Cold War. Drago’s training is a combination of powerlifting, training for muscular endurance, and endurance. We’re going to focus on both extremes with a solid amount of powerlifting and Olympic lifting at low reps with heavy weight, and still solid weights, but very high reps.
Rest periods don’t have their place when we’re training for endurance. So don’t expect a whole lot of recovery time. When we’re lifting heavy, expect a bit more time to recovery, but make sure you’re warmed up! You’re going to be lifting close to your maximal weight, so make sure you have your form down correctly, and are properly warmed up before you start the workout. 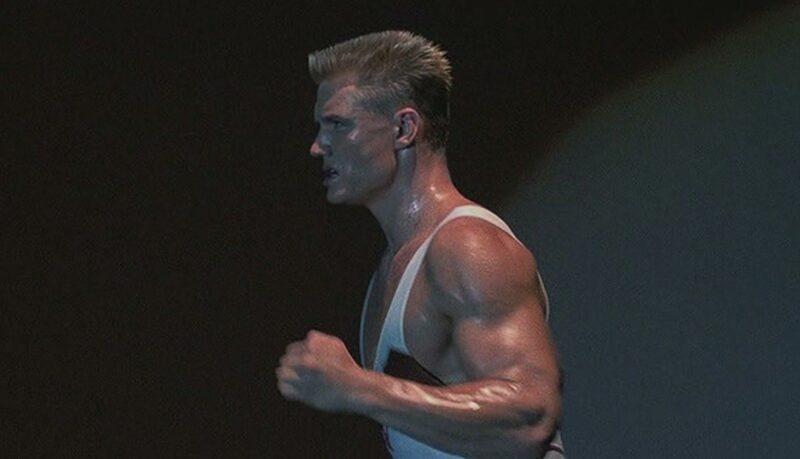 the Ivan Drago workout… For FREE of course – Enjoy!